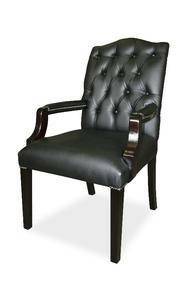 This elegant leather chair with wooden Mahogany stained legs is suitable for cafes, restaurants, coffee shops, lodges, hotels, boutique hotels, private homes and reception areas. Dimentions are W630 xD740XH1100. Requirements for plain fabric 140cm wide only. 5 year Guarentee covers workmanship and components. The guarentee excludes abuse and normal wear and tear. (5 days a week, 9hours a day is considered normal use) 110kg is considered normal. Choose your own fabric from our collection of samples.